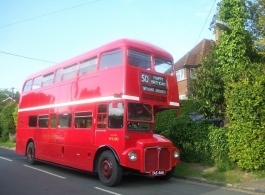 Classic Red London Buses for wedding hire. The 72 seat Routemaster Buses are the number one mode of wedding transportation when large numbers of guests are attending your wedding. These classic London Buses are ideal for taking your guests to and from the wedding venue and a great atmosphere is created with everyone travelling together. As these are old traditional Buses they will not undertake late night journeys, we may however be able to offer modern coach hire for the evenings. Please note, there are 3 of these Buses all of the same style, colour and seating capacity.